Get ready to turn your swag on Tampa, because the Turnt Up Tour gets low on the University of South Florida at the Sun Dome! 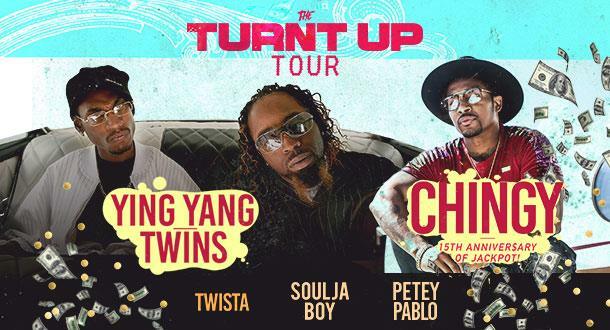 Bring your Top 8 MySpace friends to the nostalgic renaissance of early 2000's rap, hip hop and R&B with the Ying Yang Twins and Chingy, Twista, Soulja Boy and Petey Pablo on Thursday, May 17 at 8:00 p.m.
4202 East Fowler Ave, Tampa FL, 33620. The Ying Yang Twins have been heralded as the kings of the club circuit and have ridden their witty lyrics and perfect production value to the top of the charts. The Atlanta based duo of Kaine and D-Roc released their platinum album "Me & My Brother," which brought fan favorites such as "Salt Shaker," and "Whats Happnin!" Subsequent hits such as "By Myself" and "Say I Yi Yi" landed the Ying Yang Twins on the party-starter circuit and into guest appearances on albums from Lil Jon & The East Side Boyz to Kizzy Rock. Chingy will be celebrating the 15th Anniversary of triple platinum album "Jackpot" which yielded smash hits "Right Thurr," "Holidae Inn," and "One Call Away." His second album "Powerballin'" reached Platinum status with the single of the same name and his third album "Hoodstar" reached Certified Gold status. Chingy has universal appeal headlining tours in North America, Europe, Australia and Africa. The headliners are joined by Petey Pablo with rap anthems "Freek-A-Leek," "Raise Up" and "Carolina Colors" which have become mainstays on urban radio and sports stadiums across the country; and Soulja Boy, who's "Crank That (Soulja Boy)" has inspired flash mobs and dance-offs across the world. Tickets can be bought on Ticketmaster for a variety of tiers depending on location and proximity to the stage. Platinum Tickets start at $115 for front row center and go up to $173. Other areas on the floor are in the $60 tier as well as tickets at mid-court in the 100 level. Seats in the back of the arena on the 100 level are in the $45 tier and the lowest tier tickets start at $20 in the 200 section of the arena. If you are a USF Student, you can bring your USF ID to the ticket office and get a $20 ticket fees included! However, this deal is limited to two per ID. With a variety of ticket prices you are sure to find a price and location to enjoy and in the newly renovated Sun Dome, there are no bad seats in the house. Warning to the children of the early 2000's with children of their own in 2018, this concert is likely to be NSFW in nature; so hopefully your sitter is "One Call Away" so you can enjoy these "Slow Jamz" for one night only. If you're into the summer concert circuit or want to learn more about events happening at the USF Sun Dome, stay connected to MyArea Network and 813area; and enjoy our favorite local restaurants and bars before and after the concert! As always, it's free to join.